A Swiss pilot ditched safely into the chilly waters between Morocco and Spain Wednesday after a technical malfunction ended the first attempted intercontinental crossing on jet-powered wings. A rescuer helicopter winched Yves Rossy to safety from the wind-swept Atlantic. Rossy, a 50-year-old former fighter pilot, had taken off from Tangiers but five minutes into what was supposed to be a 15-minute flight he vanished from TV screens providing live footage from planes and choppers accompanying him. For a good 10 minutes, no one knew where he was. "The good news is that he is fine," Stuart Sterzel, CEO of sponsors Webtel.mobi, told reporters on a beach outside this southern Spanish town, where Rossy was supposed to land. "He gave the thumbs-up sign through the door of the helicopter," said Sterzel. Sterzel said the wing malfunctioned, possibly due to engine failure, but said Rossy had deployed his parachute and landed in the water in a controlled fashion. Things started off fine. As planned, Rossy stood on the ledge of an open door on the small plane that took him into the air, and jumped, deploying the wing and plummeting about 500 meters until he upped his thrust and gained flight at a cruising speed of 220 kilometers per hour (130 mph) at an altitude was 1,950 meters (6,500 feet). The wing has no steering mechanism. Rossy guides it by shifting his weight. He banked sharply left at first, and strong winds buffeted him. At one point he flew through clouds and was lost from sight. Below him, a ferry sailed from Morocco to Spain. Sterzel says Rossy went down about a third of the way into the flight, but did not crash. Rather, it was his decision to ditch. He was in the water about 12 minutes. "He was in control of the situation," Sterzel said. He called Rossy a hero just for trying, even though he did not make it from Africa to Europe has planned. "He is a man of courage," Sterzel said. "He will get up and dust himself off." Rossy was flown to a hospital in the southern city of Jerez for a precautionary checkup. Sterzel said a full rescue rehearsal with Rossy in the water had been carried out Tuesday and the team had been fully prepared. He said Rossy would probably attempt the crossing again in the new year. 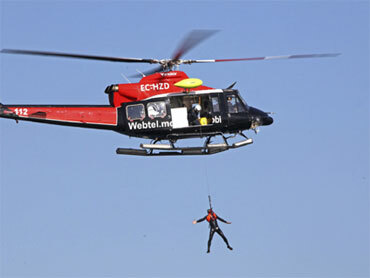 The Spanish coast guard was expected to retrieve the wing and the parachute from the sea. Rossy attempted the feat wearing a homemade wing spanning 2.5 meters (8 feet) and powered by four kerosene-fueled jet engines. His endeavor had been billed as the first intercontinental crossing by man using jet-powered wings - over the North Atlantic between Africa and Europe. Rossy provided the first public demonstration of his homemade aircraft in May 2008, doing figure eights over the Alps before touching down near the eastern shore of Lake Geneva. He flew across the English Channel in September last year, going from Calais, France, to Dover, England. This time the weather was of particular concern because Rossy had to fly over the spot where the Atlantic flows into the Mediterranean through the Strait of Gibraltar. This makes for high winds that can suddenly change direction, or blow in two directions at once at different altitudes, organizers said. "We are very proud of him," said Sterzel. "We are extremely satisfied with his attempt. If something is easy it's not a challenge."